Trying some home remedies for eczema management, may be the way to go if you looking for a natural approach to treating your skin. There are some things that you could use that you may already have in your cupboards. Oatmeal can be great for eczema. It is good for moisturising your skin. It keeps the skin hydrated, can relieve itching, and reduce inflammation. All home remedies are best made from natural products. And you can't get more natural than organic oats. The oatmeal used is usually colloidal oatmeal. Colloidal oats are very ground oats and you can make your own. Just buy some oats and put them in a blender or coffee grinder and blitz them until they're a fine powder. When buying oats to blend, you may be better buying gluten free oats, especially if you are intolerant or allergic to gluten. Instant oats are not suitable to use. This includes quick oats and the flavoured oats. You can also buy colloidal oatmeal already to use. You can use both colloidal oatmeal and rolled oats in your bath. Colloidal oatmeal can be used directly in the bath. While the water is running add a couple of cups of oatmeal under the tap. Mix well, so it is evenly spread in the bath. Rolled oats can be put in a pair of tights or pantyhose, then the end is tied. The tight ball is then put in your bath and left for 10-15 minutes. With both ways you can then soak in the bath for up to 20 minutes. Many soaps you can buy can aggravate your eczema, by drying out your skin. There may be some brands that are gentler on the skin, as they don’t have many, if any, added ingredients in them. So you could buy a good oatmeal soap. Just always check the packaging to see what added ingredients are in it. 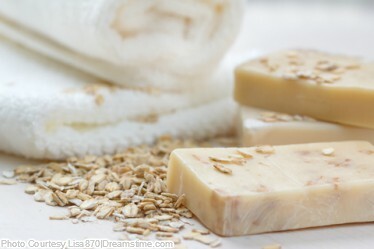 If you would like to know what is in your oatmeal soap, you could make your own. Instead of Dove as the recipe suggests, you can use any soap. The more natural the better. You can buy a cream or lotion, like Aveeno, that is made from oatmeal. You can also make your own. An easy way is to add some colloidal oatmeal to your favourite cream. You could also add some to yoghurt, and perhaps add some honey. If you would like a face mask, add a little milk to the oats. Goat milk is a good choice. Mix it until it is like a paste. Then apply to your skin. Leave it on for 10-15 minutes, then rinse off. If you are intolerant or allergic to dairy, rice milk or soy milk are a good alternative. Baking soda is also known as bicarbonate of soda, and sodium bicarbonate. It can benefit your eczema as it is a great cleanser with antibacterial properties. It deep cleans, and will leave your skin feeling smooth. You can use it in your bath. Just add half a cup to your bath. Mix in well, and soak for no longer than 20 minutes. You can also mix some with water to make a paste. Use a 2:1 mixture. So if you use 2 tablespoons of baking soda, mix with 1 tablespoon of water. You can put the paste on your skin and gently rub in. You can then either rinse your skin, or gently remove any excess left. Apple cider vinegar has been used for many years as a natural treatment for many different ailments. It is one of the most versatile home remedies for eczema. As the name suggests it is made from apple cider. To relieve eczema symptoms it is recommended that you use organic. One free from additives and other chemicals. Organic vinegar contains the 'mother'. The 'mother' is a ball of goodness that you can see floating in the vinegar. It contains the beneficial properties of apple cider vinegar. You can use it internally or externally. 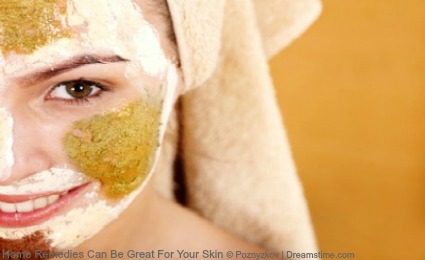 Only use diluted apple cider vinegar on the skin. Even diluted it can sting a little when applied to the skin. Don’t worry as it doesn’t last long. Apple cider vinegar benefits everyone, and it is safe to use on children. Though a weaker solution should be used. Add more water to the mixture, and add less to the bath. If you are diabetic it is recommended that you speak to your doctor before taking it internally. All of the above are natural products. If you buy the right type they will be free from additives and other chemicals. 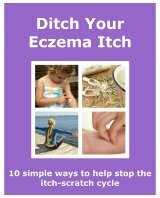 This will make them even better home remedies for eczema, and help relieve your symptoms. It also means that it will be rare for them to cause an allergic reaction, or make your symptoms worse. You can read further about natural treatment for eczema, including oils and herbal remedies.